This is a dangerous time in our country. Safeguards for working people are being attacked, from safety and health regulations to overtime pay. The basic right of working people to organize and bargain a contract is being threatened by members of Congress doing the bidding of the U.S. Chamber of Commerce and other corporate groups. Wall Street and bank regulations put in place to prevent another economic collapse like we experienced during the Great Recession in the late 2000s are being dismantled. We are living in dangerous times. 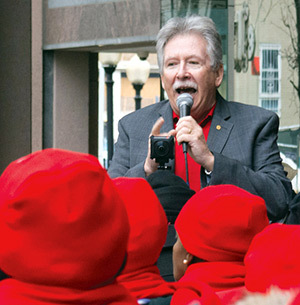 But it also could be a time of extraordinary accomplishment by CWA members. It could be the time that more of us than ever before engage in resisting rollbacks in our contracts and rights and fighting for the good jobs and good benefits we deserve. CWA STRONG is a challenge to all of us, to create a shared understanding of the forces targeting our jobs, living standards and rights, and to reinforce the power and strength of our unity and solidarity so that we can continue to protect our contracts and rights on the job. Our opponents are powerful and wealthy. This is an “all hands on deck” moment with no room for bystanders. We know how to do this. We are a tough bunch. CWA members have stayed on the picket line one day longer and one day stronger than management ever expected. We’ve mobilized for tough contract fights. We have made stopping contracting out and bringing back jobs sent overseas a priority. We led the fight to stop the Trans Pacific Partnership (TPP), a trade deal that would have given U.S workers a raw deal and cost U.S. workers millions of jobs over time. We've faced challenging times and powerful opponents before. Decades ago, we faced the upheaval of telecom divestiture. Today, we’re up against mergers that combine communications and content companies, the consolidation of airlines, deregulation of our industries, the corporate demand for offshoring and more. As members, we know the value of a STRONG CWA and each of us must make sure that every co-worker at every workplace knows that as well. We are CWA STRONG.